There is a common misconception among landowners that pine plantations provide poor wildlife habitat while hardwoods provide excellent wildlife habitat. Here at MRM we love a beautiful hardwood bottom as much as anybody, but the reality is that research shows using selective herbicides and fire to manage pine forests can produce excellent wildlife habitat for species including deer, turkey, quail, and many regionally declining songbirds. When early explorers surveyed this land centuries ago, there were vast open pine stands with grassland understories scattered on hilltops across the Southeast. Native Americans used fire to maintain these ecosystems for hundreds and perhaps thousands of years. Unfortunately, most pine plantations in our region today are densely populated with undesirable hardwoods in the mid and understory greatly reducing the overall quality of the wildlife habitat. A single herbicide application will effectively reclaim the pine-grassland structure of the stand and allow managers to maintain this structure with prescribed fire. When properly applied, selective herbicides are the keys to unlock the wildlife habitat potential of your pine forest. Our resource management professionals here at MRM try to help landowners manage their lands “smarter not harder”. If improving habitat for deer is a management objective on your property, the proper application of herbicides is a cost effective tool that will drastically improve the deer habitat in your pine stands. 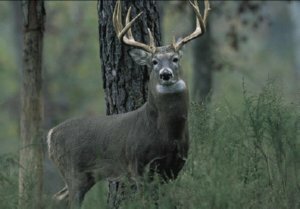 A research project conducted by Mississippi State University compared the deer habitat quality in unsprayed pine stands with pine stands that had been sprayed and released from hardwood competition. The study results published in the Wildlife Society Bulletin in 2004 reported that the volume of deer forage and available digestible protein increased significantly in sprayed pine stands compared to stands that had not been sprayed. 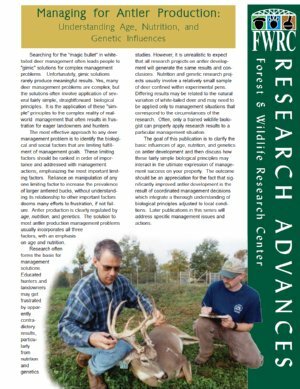 In other words, the research found that not only was there more food available for deer in treated stands, but there was higher quality food available for deer per acre. The study reported that the habitat quality of the pine stands that were treated went from 7 to 268 deer days per hectare, drastically increasing the carrying capacity of the land. The amount of digestible protein was also compared to intensively managed cowpea food plots. 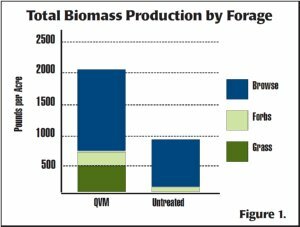 It was reported that a landowner can produce the same amount of digestible protein in their pine stand for about half the cost per acre than annual food plots. Managing your pine stands in this way is not only a cost effective way of producing high protein foods for your deer herd, it also creates a much larger food source across your entire property. 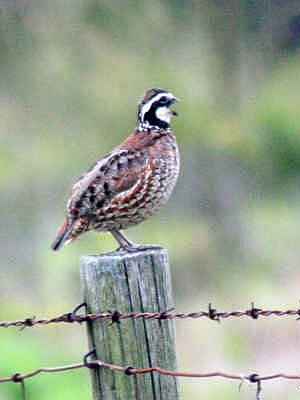 Research has proven that quail numbers will increase in response to proper habitat management. When it comes to quail management, pine forests hold the greatest potential for quality forested quail habitat. A pine forest goes through different successional stages throughout its rotation that vary in wildlife habitat quality. Usually the first few years of a pine forest have the potential to be relatively good wildlife habitat. From about year 6, to the first thinning, is the least productive stage of the forest when it comes to wildlife habitat. Once the stand is thinned, a properly applied selective herbicide combined with prescribed fire, is the key to unlock the full potential of your pine forest. 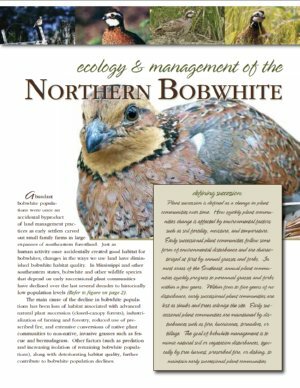 A research project conducted on the Noxubee National Wildlife Refuge from 2007 – 2009 investigated the response of quail and other important bird species to herbicide and fire treatments in pine forests. The researchers found that herbicide and fire created suitable habitat for quail and other important pine-grassland bird species. 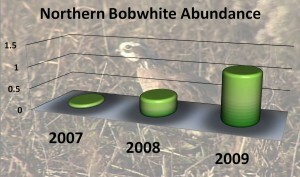 Quail abundance, as well as the abundance of other regionally declining songbirds, increased after the management was implemented. One critical component of meeting a turkeys annual habitat needs is providing adequate nesting habitat. Turkeys typically nest in areas with dense herbaceous ground cover such as cutovers, old fields, right of ways, and open pine forests with adequate ground cover. Properly applied selective herbicides and fire create a grass/forb dominated understory that is excellent turkey nesting habitat. A research p roject conducted in east-central Mississippi reported that hens were found nesting in 15-20 year old pine plantations that had been thinned and burned. The nesting success rate in mature pine forests was reported to be much higher than other habitats such as young pine plantations. 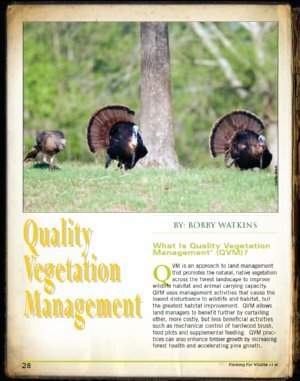 Any landowner interested in turkey management with a mid-rotation pine plantation on their property has an opportunity to boost the quality of nesting habitat on their property. 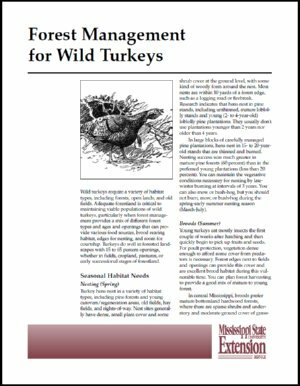 Simply put, better nesting success typically means more turkeys on your land. Another important annual habitat requirement for turkeys is brood rearing habitat. Young polts consume primarily insects during their first two weeks after hatching. Pine stands that have been thinned, sprayed, and burned create a herbaceous community that attracts large volumes of insects which greatly improves the brood rearing habitat. Hens have the option of rearing their broods under the protection of a forested habitat as opposed to spending large amounts of time in open fields where they are most vulnerable to predators.